The sale of this business presents any prospective buyer with a perfect opportunity to lease a fully equipped front-line restaurant on the very busy traffic-free promenade in Cala Millor. This immaculately presented restaurant has been cared for by the current owners and is ready for any buyer to take-over, walk in and start trading immediately. This front-line restaurant is situated on Cala Millor's main promenade close to an abundance of hotels and apartments ensuring a constant trade all year round with both tourist and residents alike. Currently trading all year this restaurant boasts 300m2 with ample seating inside to ensure trading in winter. Interior seating consists of 18 tables. The restaurant has a very large commercial kitchen, 2 large storerooms, private toilet, large bar. 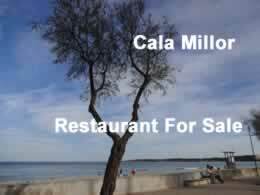 This is an outstanding opportunity to take over such a business in a much sought after spot in Cala Millor.